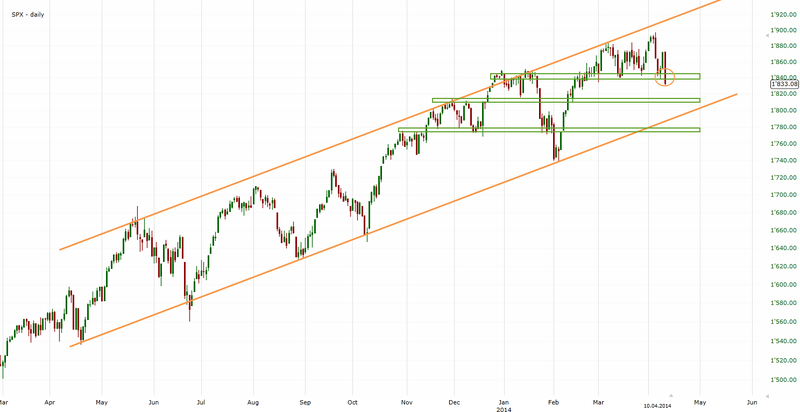 After trading between 1840 and 1880 for almost two months the SPX broke below 1840 today. Before we get too bearish we need to see a confirmation. That is, either a continuation tomorrow or a backtest of 1840-50 followed by a reversal. If we don't get such a confirmation, we may get a similar pattern as last week. Then, the bulls were tricked after the SPX rallied above 1880. If the market continues its drop tomorrow, we should see 1813ish next.